The U.S. Department of State recognized Rochester Institute of Technology for success providing study-abroad opportunities for students with disabilities. RIT was named to the inaugural list of U.S. higher education institutions that sent the most students overseas on the Benjamin A. Gilman International Scholarship Program in academic year 2016-2017. The Gilman Program aims to make international study and internships more accessible and inclusive for American students of all backgrounds. 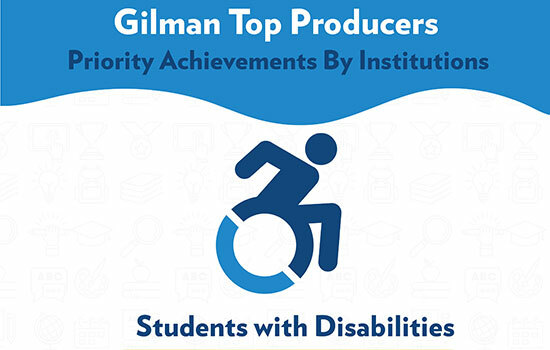 Among medium-sized colleges and universities, RIT was tied for the most Gilman Awardees with disabilities with three in 2016-2017. RIT is one of just 36 universities nationally named to the Gilman Top Producing Institutions list. Roberto Ramos-Brito, a third-year student double majoring in electrical engineering technology and applied modern language and culture from Camillus, N.Y., will study in Genova, Italy, this summer. Third-year applied arts and sciences student Alana Smith of Riverside, Calif., will study in Copenhagen, Denmark, over the summer. Nathanael Thomas, a fourth-year student double majoring in applied arts and sciences and international and global studies from Bethesda, Md., will travel to the Himalayas this summer to study in Bhutan. The Gilman Program, with the support of the U.S. Congress, broadens the U.S. student population studying and interning abroad by providing scholarships to outstanding undergraduates who, due to financial constraints, might not otherwise participate. Since the program’s establishment in 2001, more than 1,300 U.S. institutions have sent more than 25,000 Gilman scholars to 145 countries around the globe.